After absorbing the concept of a Phoenix team playing great defense with Alvin Gentry in the building, let’s begin this week’s edition of Sun Spots. 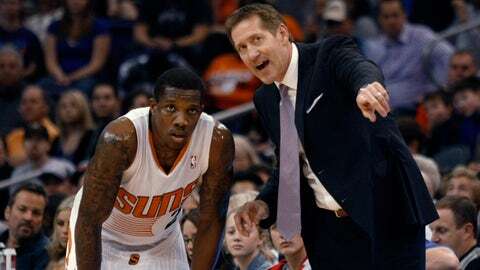 A rival assistant coach thinks Jeff Hornacek and the Suns are on to something with the backcourt pairing of Eric Bledsoe and Goran Dragic. While many league followers expect the Suns to eventually use half of their dynamic point-guard tandem of Goran Dragic and Eric Bledsoe to help facilitate the acquisition of an elite-level player, one NBA assistant coach thinks that would be a mistake. "Well, you probably have to listen to what other teams may offer in a trade," said the coach, who works for another Western Conference team, while watching the Suns take on the Clippers in L.A. on Monday night. "But in Dragic and Bledsoe, the Suns have something no other team can throw at you." "Two quick, strong playmakers that play both ends, get in the lane and either score or find guys," he said. "A lot of people were thinking that they would get taken advantage of on defense by bigger two-guards, but their speed advantage creates far more problems for other teams on defense than their height does in defending bigger shooting guards. "With very few exceptions, not many two-guards are very good at posting up. They just don’t do it very often. When you look at how Phoenix is rolling on offense now that both guys are healthy and how they can put pressure on the ball defensively, I think it would be nuts to break that up. I know it’s really tough to prepare for." 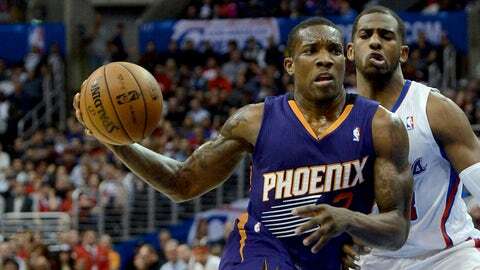 For what it’s worth, Eric Bledsoe checks in at eighth among Suns in plus-minus rankings. According to the individual rankings on a website called sportingcharts.com, Bledsoe checks in at 151th among NBA players for plus-minus (0.5) per game. While some local media skeptics use such numbers to temper their enthusiasm for Bledsoe’s importance, I prefer to recall the plus-minus opinion of Oklahoma City Thunder coach Scott Brooks. "Those can be really misleading," Brooks, speaking before a preseason game vs. the Suns at U.S. Airways Center. "I mean, what if Kevin (Durant) is minus-10 or something in a game? If I go by the numbers and sit him, I can miss him going for 40 (points). "Where will those 40 come from? Plus-minus has a purpose, but â¦"
Although plus-minus can be of reasonable assistance in determining the success of different combinations, there are too many competing variables (such as who you’re playing against and when, etc.) to make it worth investing excessive thought. For the record, Bledsoe is eighth among Suns players for individual plus-minus. Dragic (ranked 31st in the league) is the highest-ranked Phoenix player, checking in two spots ahead of Channing Frye. Frye, whose ability to makes 3s keeps the floor spaced for the driving antics of Bledsoe and Dragic, certainly wouldn’t be No. 2 (among Suns employees) on any general manager’s wish list. 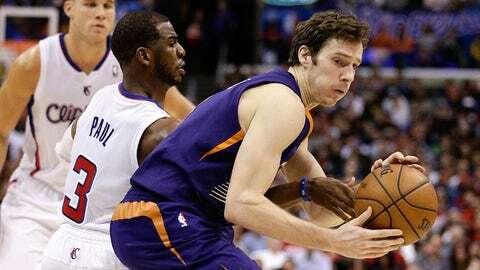 Goran Dragic stole the show in Monday’s win over the Clippers with 26 points, eight assists and five steals. While Monday’s pre-game focus understandably surrounded the showdown between former teammates Bledsoe and Clippers superstar Chris Paul, much of the show was seized by Dragic. The Dragon hit the Clips for 26 points (making 10 of 15 shots from the field), eight dimes and five steals. While Goran requires very little motivation to provoke fits of great energy, the Clippers’ attempt at handling Phoenix’s two-point-guard alignment created even more familiarity. Enter Clippers back-up point guard Darren Collison, who — as the successor to Bledsoe as Paul’s valet — was on the attack when matched against Bledsoe. Collison has spent time working out with and against Dragic during off-season maneuvers in Los Angeles. They have the same agent (Bill Duffy), who has set them up with the same trainer. When it was suggested that attempting to upgrade his skills against a player with Collison’s quickness, the ultra-competitive Dragic refused to admit he was the underdog in this fast-twitch battle. The likes of Gerald Green, Goran Dragic and Miles Plumlee give the Suns a leg up on their competition in terms of athleticism. OK, the Suns don’t employ LeBron James, but looking top to bottom at its rotation players, Phoenix might have more elite athletes than any team in the league. For perspective, let’s revisit the NBA assistant we consulted on the Dragic-Bledsoe situation. "Well, athleticism covers a wide range," he said. "Like Steve Nash should be considered a great athlete if you use balance, agility and so forth to define athleticism. "What I think you’re looking for when you talk about athleticism is explosiveness. Which team has the most run-jump, fast-twitch guys?" A review of the Suns’ rotational lineup features speed and quickness in Bledsoe and Dragic, crazy ups from Gerald Green, and an unusual strength/bounce combination in Miles Plumlee. Rookie Archie Goodwin isn’t exactly a slouch at running and jumping, while the Morris twins have rare agility for their size. "The Thunder has some great athletes," our coaching source said. "There’s just so many guys in the league that can go. But I think Phoenix may be as twitchy as any of ’em." More importantly, they’re pretty skilled, fearless and relatively unselfish. 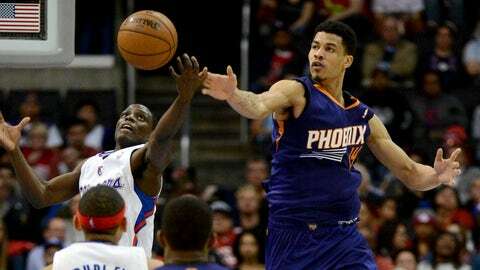 Gerald Green came through with 21 points off the bench in Monday night’s impressive win over the Clippers. With their triumph in L.A., the Suns finished Monday at 19-11 on the season and sitting as the conference’s sixth seed, just one-half game behind the Clippers and Houston Rockets (both are 21-12; the Clips’ superior conference record has them in fourth place with the tiebreaker). 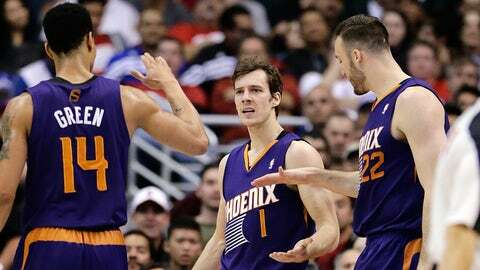 Last season’s deep-lottery Suns didn’t achieve their 19th victory until Feb. 26. The Suns will begin the new calendar year with home games against the Memphis Grizzlies (Thursday) and Milwaukee Bucks. That brief home stand will be followed by a five-game roadie, with stops in Chicago, Minneapolis, Memphis, Detroit and New York (Knicks). Each opponent in this seven-game swing currently has a losing record. Monday’s defensive lockdown of the Clippers enabled the Suns to jump to 12th in the NBA for fewest points allowed per 100 possessions. They also are sixth in the league for effective-field-goal-percentage defense and fifth in effective-field-goal percentage offense. After back-to-back, 3-for-9 shooting performances, Green rallied to drop 8 of 14 shots against the Clippers. Green finished with 21 points off the Phoenix bench, including 14 in a second quarter won by the Suns won, 31-16.